Nearly everything has been done from my to-do list, bar the digging and putting black plastic under the watermelons. Shifting the manure between bins was hard work, but it’s done and the 2 empty bins were topped up with the really steaming stuff from the middle of the new delivery. 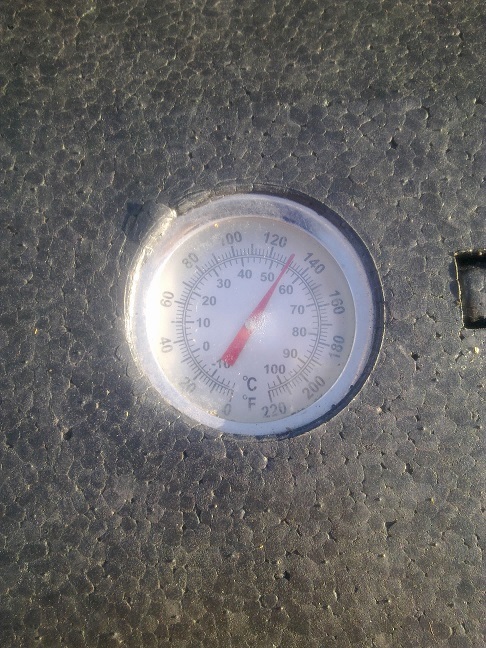 The hotbin was registering 55C this evening, so this time I might have cracked it! I did properly stink afterwards: it reminded me of my weekends working in the local stables. Harvested lots of beans, courgettes, lettuce (! ), and cucumbers, as well as the Charlotte potatoes. These had no slug damage, but one plant where a few were rotten. I set them out to cure for a few hours and they are in a bag in the garage, still to be weighed. 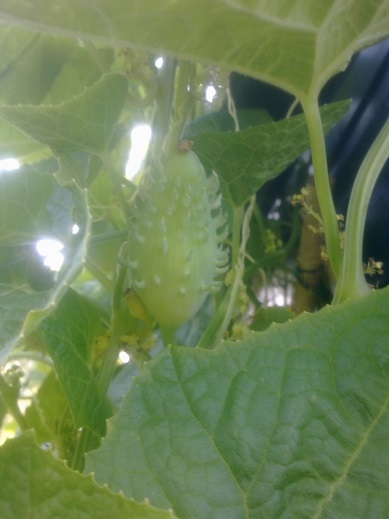 Need to start picking the achocha or they will be getting too big. The 3 plants seem intent on covering the shed. I never dreamed that they would get so huge! 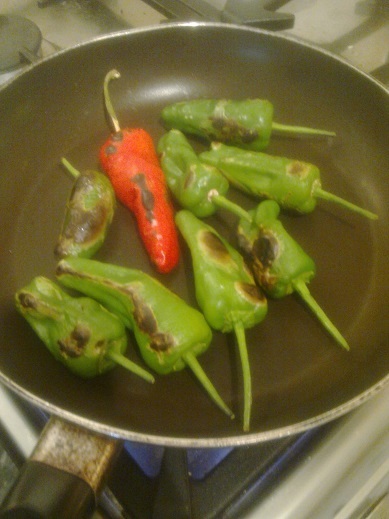 Also harvested one of the Padron pepper bushes and we had them for dinner tonight. It’s supposed to be a bit like Russian roulette, with a few being hot – nearly all of them were veeeery spicy! Lovely, lovely things though – will be growing lots more next season so we have plenty and often. Blight has definitely hit tomatoes on the Upper Field, and am hoping that the hedge and various lines of beans keep the spores at bay for us on the Lower Field. I will be checking my plants for signs more regularly – there are 2 which might be iffy. Checked over the squashes – there’s a Thelma Sanders ready to open tomorrow, with 2 male flowers, so I figured I’d have a go at saving from that too & bagged them. There are hardly any of those seeds left in my packet. I can’t see any male flowers for use on the Black Futsu that’ll open tomorrow, so am leaving that in the lap of the bees…Also accidentally trod on a Rouge Vif sideshoot and knackered it. The brassica plug plants from Marshalls have arrived. To be honest they aren’t brilliant, but in this heat might not have travelled well. They look quite sickly and 2 of the 3 leaves on most of them are yellow. What rankles is with p&p they cost a fortune and my local B&Q has better plants at a fraction of the price. That’ll teach me! They’re potted up for now and under veggiemesh with the leeks and my own (more robust) kale seedlings. One last thing – I converted some sad spare apples into apple slices via the dehydrator, dipped in lemon and sprinkled with cinnamon. So delicious that a jar of them lasted max 10 minutes between us in the car on the way to Northampton. Definitely one to repeat.